When Oracle Multitenant was released with Oracle Database 12.1.0.1.0 in June 2013, Oracle Application Express was installed by default common in the CDB in CDB$ROOT, PDB$SEED, and all PDBs. In fact, that was the architecture that we recommended at that time. As we have gained experience with multitenant in our internal deployments, we realized that our initial recommendation was wrong. 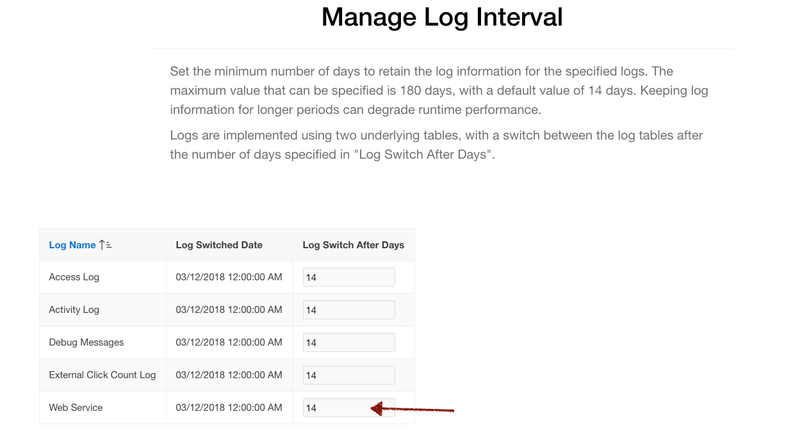 Having APEX installed common locks you in to one version for your entire CDB, and when you need to upgrade APEX, you have to upgrade every PDB, even if that PDB is not using APEX. This would cause unnecessary added time to APEX upgrades. 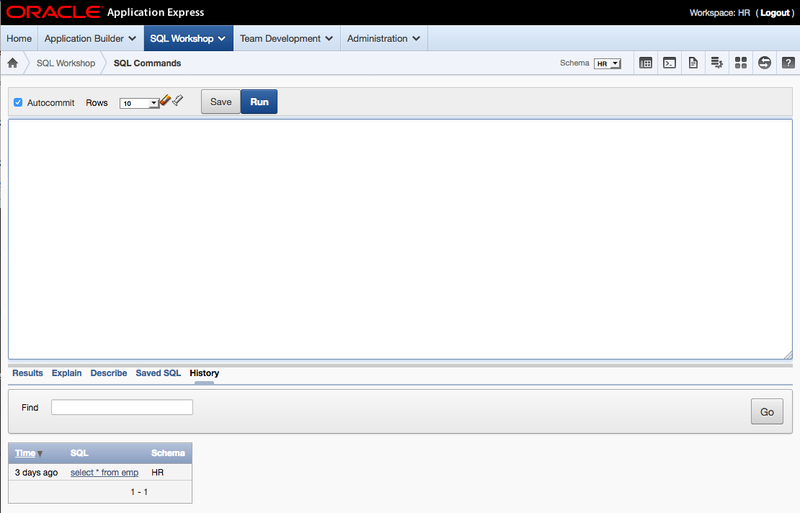 Applying the lessons we have learned in our internal deployments, we have been recommending that customers remove Oracle Application Express from their CDBs and install APEX locally in PDBs since version 5.0. What do you do if you have been using the common APEX from 12.1.0.1.0 or 12.1.0.2.0, and now you want to follow our new recommendation of having APEX installed locally in a PDB? We have been asked that question many times by both internal and external customers. Unfortunately there is no simple answer, no magic SQL script you can run to do the conversion, so we have never really had a good answer. Then my manager, Joel Kallman, had a novel idea. He reminded me of the work I did for the Oracle Database Cloud Schema Service, to effectively export almost every single artifact of a workspace, using the command line utility APEXExport, so that a schema service tenant could be moved from one APEX instance to another. This involved greatly expanding our workspace export code, modifying APEXExport to allow for more export options, and then scripting the calls to APEXExport, including creating an installer script to invoke all the exports, and finally zipping the scripts produced. Joel's idea was to reuse this method in a process to convert a CDB where APEX is installed common, to a CDB where APEX is installed locally in PDBs. I have a 12.1.0.2.0 CDB with two PDBs running APEX. One PDB has multiple workspaces, the other PDB has only one workspace. The CDB is the default APEX 4.2.5.0.00.08 that shipped with 12.1.0.2.0. 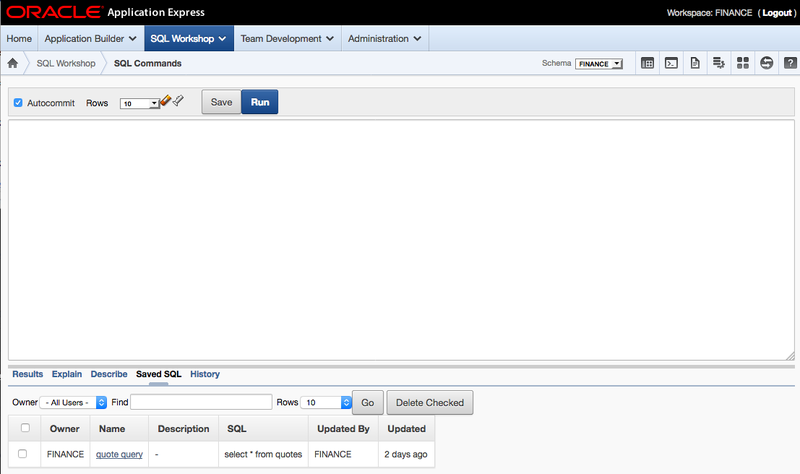 The workspaces may have SQL scripts uploaded to SQL Workshop, SQL History and Saved SQL that we want to preserve. There are sample and packaged applications that we want to preserve. There are also custom built applications on objects in the schema associated with the workspaces. There are workspace images, and static files that we also want to preserve. I have already completely backed up my CDB. The original script that I wrote was in C shell and did the job, but my colleague Vlad Uvarov rewrote it in bash (apparently anyone under 40 no longer uses C shell) and vastly improved it. A slightly revised version of the script is listed below. One thing to note in the script above is that the install script being generated assumes that APEX 5.1 is installed in your target APEX instance. If that is not your plan, change the line "alter session set current_schema = APEX_050100" to match the APEX schema of the version you plan to install locally in your PDBs. Also, for convenience, I am going to temporarily unlock APEX_040200 in my CDB and set a known password, and pass those necessary credentials to the workspace_export.sh script. 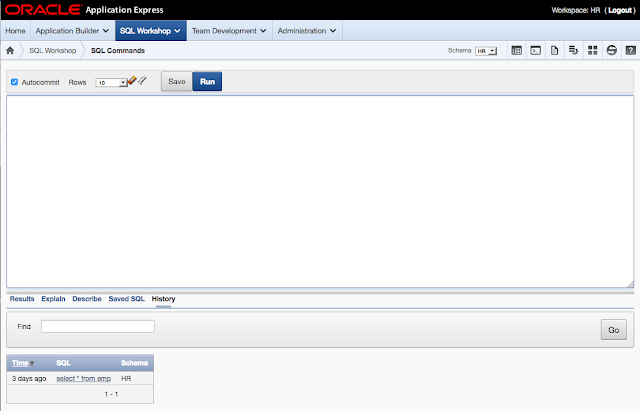 You could really use any database user that has been granted the APEX_ADMINISTRATOR_ROLE. I saved the script above in a directory where I want all my zip files to end up. Now I will call the script passing each of the workspace IDs I identified in the previous step. I have a complete backup of my database, and I have all the zip files that will reconstruct my workspaces. It is time to do the actual conversion. Performing installation in multitenant container database in the background. The installation progress is spooled into apxremov*_con*.log files. First, I am again going to temporarily unlock and change the password for the APEX database user, in this case APEX_050100. Since now APEX_050100 is a local user to the PDB, I have to do it in both APEX1 and APEX2 PDBs. Then I unzip each complete workspace export and run the corresponding install script. Now we login to each workspace and check that all the artifacts from the workspace migrated over. Actually, two more things. First, this process will not bring over "Template Applications" and "Public Themes." 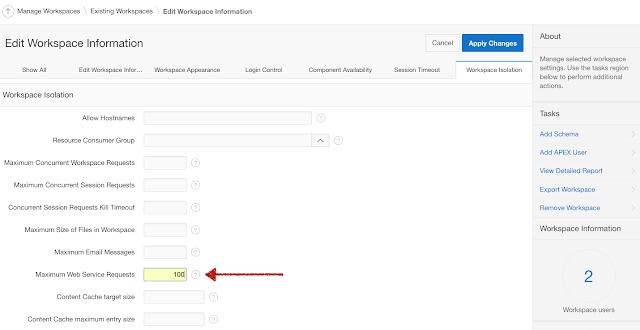 These features are not well known and rarely used, but you can easily determine if you have them by logging into internal administration, click on Manage Instance, and then click the Public Themes and Template Applications links. If there are applications in either area, simply export them, and them import them into internal administration after you recreate your workspaces. Second, you may want to create another PDB, call it APEX51SEED, and install APEX into it. Put the PDB in read only mode, and then when you create a new PDB, you can create it from APEX51SEED and it will already have APEX 5.1 installed locally. In our case, we could not use this method to install APEX only once, because we needed the schemas that were in our APEX1 and APEX2 PDBs. Having APEX installed locally in PDBs provides greater flexibility in your CDB, reduces upgrade time, and as well simplifies unplug/plug operations of your PDBs between CDBs. If you have a CDB where APEX is installed common, and you are using APEX in some or all of those PDBs, it is possible to do an in-place conversion using the method described above. Unfortunately, there is no magic SQL or script that can simplify this process. I hope you are successful if you go down this path, but be sure you have a complete backup of your CDB before trying. You can also use parts of this method to simply move a workspace from one APEX instance to another. That would require you to also move the schema, using datapump or another utility. Ooops... I did it again. APEX 5.1 is released! As Shaun points out at this forum post, the appendix of the Oracle Application Express 5.1 Installation Guide is missing instructions to downgrade back to 5.0, after a failed upgrade attempt. My bad. I signed off on the Oracle Application Express Installation Guide as being complete for 5.1. Unfortunately, I did not pay enough attention to the appendix. We will get this corrected soon in a refreshed version of the Installation Guide, but in the meantime, below are the instructions we will be including. If you altered your images directory, revert it back to the release you want to revert to. See "Reverting the Images Directory." 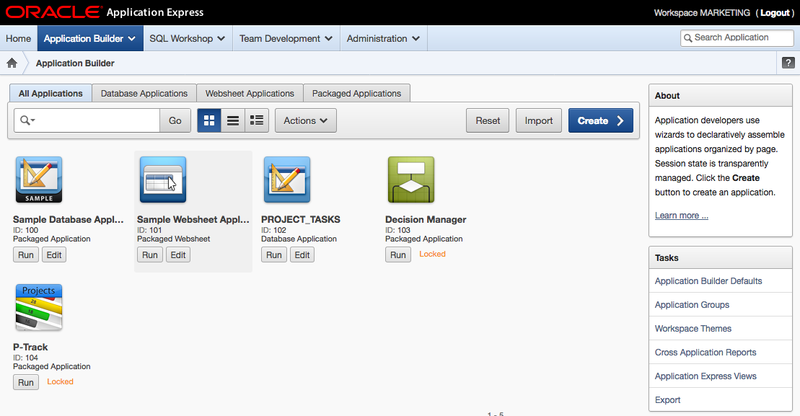 Change your working directory to apex/core in the 5.0 source. 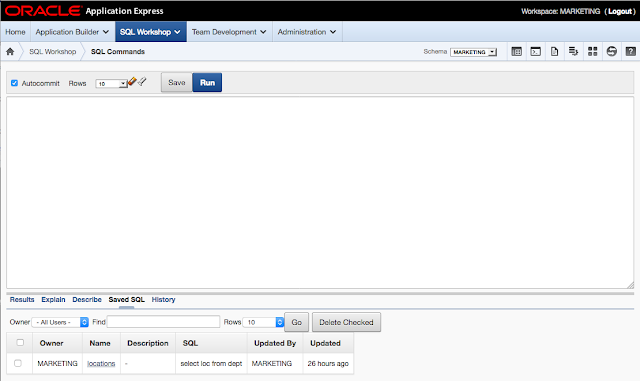 See the next section, "Removing the Oracle Application Express Release 5.1 Schema."